The hidden city of Chachapoyas is high in a remote cloud forest in the Andes. We think this is one of Peru’s best hidden treasures. The most important site in Chachapoyas is the historical city of Kuélap. 3000m above sea level, this ancient city features over 550 structures. It is estimated that more than 3,500 people inhabited the city. Many believe that Kuelap was constructed specifically for its defensibility; as its elevated location and stonewalls provided the perfect location to deter invaders. Another must see site in Chachapoyas is the Laguna de los Cóndores. Fairly unknown to travellers; only 150 visit it each year. Over 500 years old, the lake gets its name from when explorers found it and saw these magnificent birds of prey flying around the lagoon. The lake also goes by the name “The Lake of Mummies” due to the site being one of two Inca burial sites. 200 mummies were found and re-located to the Leymebamba Museum. 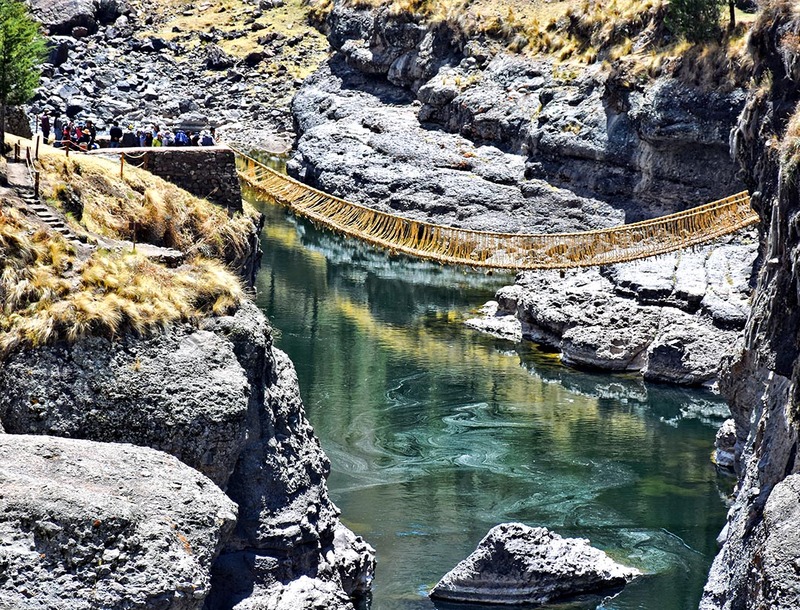 A handmade bridge made from woven grass, once an integral part of the Incan road system; Q’eswachaka spans across 35m and is suspended 18m above the canyon’s river. The Incan women braided small, thin ropes of grass, which were then braided again by the men into large support cables, much like a modern steel suspension bridge. Handwoven bridges have been part of the trail and roadway system for over 500 years. Treasured by the Incas, any tampering with the bridges was punishment by death. The Utcabamba Valley is home to the Gocta Waterfall. Discovered in the early 2000’s by German economist Stefan Ziemendorff who was hiking through the region. Stefan made his way through a blind narrow gorge when he came across a towering two-tier cataract not listed anywhere on his map. Of course locals in the area knew about the waterfall; but due to its location deep in the forest many superstitions surrounded it; therefore almost no one actually visited it. Because the waterfall is technically two in one; depending how you measure it; it’s anywhere between the third and sixteenth tallest waterfall in the world. A visually stunning spectacle; nature lovers can’t afford to miss this impressive waterfall. Getting to the waterfall requires crossing the extensive rainforest that surrounds it. The trek there and back takes roughly 5 ½ to 6 hours from the starting point of Caserío de Cocachimba. Along the trail you come across 22 further waterfalls that are even more impressive during the rainy season. We’ve only covered three, but Peru is home to a vast array of hidden gems you can’t afford to miss on your next South American exploration. Pack your bags, and get ready for the adventure of a lifetime!